In between all the goatie activity of Sunday, I spent an extremely pleasant couple of hours in the company of Monica (our acupuncturing vet), Sharon (our extremely efficient cheese-assistant-person), Kay (Reiki-lady who talks to goats!) and other lovely horsey ladies. At the end of the month it is Monica's birthday. I shall not reveal exactly how old she will be but, suffice it to say, that it is a significant birthday. You know the ones ... end with '0' and generally involve some kind of mid-life crisis and shouts of 'I cannot be THAT old'!! 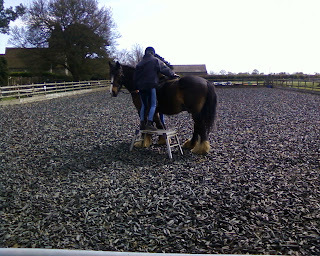 Anyway, Sharon had arranged for a special riding lesson for Monica which involved being taught to ride side-saddle on Murphy (one of Sharon's horses). As a non-horsey person I have to say that it looked like extremely hard work! 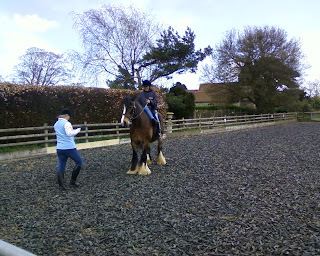 However, Monica did really well and had a wonderful time, despite being chucked off once by a grumpy Murphy. It was an elegant landing however and no injuries were sustained. Here's Murphy's companion Hadrian, another gorgeous boy! After Monica's lesson, we all retired to the comfort of Charlotte's beautiful house for a delicious tea and a glass of something sparkly to celebrate the forthcoming birthday. I would have sat there and chatted for a good while longer but I had to get home for milking and baby feeding again. Those little long-eared babies (I have nicknamed them the Nubettes) were exceedingly noisy last night whilst waiting for their tea. The Nubes have quite a characteristic strange cry and as the three of them stood in their pen shouting for their tea, many of the milkers stood up on the gate and stared at them. They had never heard anything like it before and were quite intrigued as to where the strange noise was coming from! 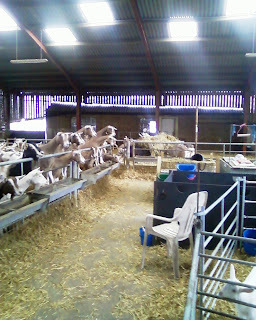 We moved them out of their little pen this morning and in with the younger group of kids. They are much tinier than everyone else but, according to Francesca, have spent most of the day running around and playing with all the others. I was hoping for another night with Marmite tonight but I think it would be wiser to spend it next to the goats. ZsaZsa is due to have her babies on Thursday but was starting to look a bit restless earlier on this evening. I don't expect that anything will happen tonight but I want to be on-site just in case ..